eSaleRugs, online at eSaleRugs.com, carries the largest selection of fine Persian and Oriental rugs around. eSaleRugs offers a wide range of area rugs, including traditional, contemporary, Oriental, and Persian rugs. Search by shape, quality, style, and size at eSaleRugs. eSaleRugs buys rugs in large volumes, and as a result is able to offer lower prices to customers. Choose eSaleRugs for your new hand knotted rug, tribal, organic, or Turkish rug. But first check RetailSteal.com for eSaleRugs coupon codes, eSaleRugs promotions, and eSaleRugs discounts. eSaleRugs offers free shipping on all rugs and a 30 day no hassle return policy. See website for full details, exclusions may apply. New customers, check out eSale Rugs online today and save 10% when you create an account and enter our coupon code at checkout. Save 25% on any one rug from eSale Rugs when you enter this coupon code at checkout. Click to save. Shop at eSale Rugs to save an extra 10% when you purchase 2 or more rugs. Click to save. 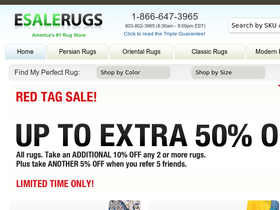 Enter this coupon code at checkout on eSale Rugs to get a $50 AMEX card when you spend $300 or more on your order. Click link to save 10% off your entire purchase at checkout from eSale Rugs. Save up to 75% on rugs at eSaleRugs.com. Click link to start shopping. Get free shipping from eSaleRugs.com on any order. Click link to shop. Get your Persian rug at eSaleRugs.com and save up to 75% off retail. Click link to shop. Shop at eSale Rugs use this coupon code to receive a free pad with every rug purchase. Click link for savings. Check out eSaleRugs.com and enjoy 50% off at their clearance sale. Click link now to save. Act now and take advantage of an extra 50% off Oriental rugs from eSale Rugs. Limited Time Only. Enjoy 50% off select rugs from eSale Rugs when you enter this promo code at checkout! Shop now and save! Click our link to head over to eSale Rugs today and use our coupon code to enjoy 35% savings.